An "input" element is an inline element. It can not be used directly inside a "form" element. It can only be used inside a block sub-element of a "form" element. 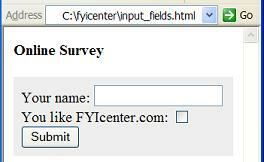 An "input" element is an empty content element. An "input" element defines an input field which may or may not be visible in a browser. An "input" element has an attribute called "type" that allows you to define the type of input field, like a text input, a checkbox, or a radio button.